The Georgian Ground Forces (Georgian: საქართველოს სახმელეთო ძალები) are the land force component of the Georgian Armed Forces. They are the largest branch of the military and constitute the bulk of the GAF. 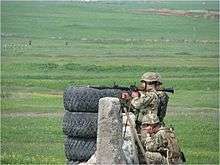 About 200 Georgian troops were deployed in the Kosovo (KFOR) in 1999–2008, 70 were deployed in Iraq (OIF) in 2003 and 50 in Afghanistan in 2004 (ISAF). From 2004 in Iraq were 300 Georgian troops. From 2005 approximately 850 troops were serving under Coalition Command (OIF and UNAMI). On July 2007 Georgia sent an extra 1,400 troops to Iraq; that brought the total number of troops in Iraq to 2,000. About 300 of these troops were assigned to Taskforce Petro and stationed at COP Cleary outside the town of Wahida near Salman Pak, Iraq.Their preparedness and training skills are evaluated on highest level by international experts. On August 8, 2008 Georgia announced it will withdraw of its troops from Iraq due to rising hostilities with Russia. On 10 and 11 August the entire contingent was airlifted back to Georgia. The structure of the Georgian Land Force is based on brigade and battalion sized army units. The Land Force is primarily composed of five regular infantry brigades and two artillery brigades. There is also one Engineer Brigade, one Air-Defense Brigade, one Signal Battalion, one Technical Reconnaissance Battalion, one Medical Battalion, two separate Anti-Tank Battalions and one separate Light Infantry Battalion. There are also the non-regular formations which are the Special Forces Brigade and military counter terror task forces. Land Forces consist of 36,553 men of which 21 represent the commanding core, 6,166 lower rank officers and sergeants, 28,477 corporals, 125 cadets and around 388 civilians. The Georgian Land Forces are commanded by Colonel Iveri Subeliani. From 1992 till 2003 throughout the Georgian army heavily relied on Soviet military equipment which got outdated over time and for most part broken due to ill maintenance. More than 100 T-55 were decommissioned and scrapped since 2000 leaving only a dozen left in the inventory. Numerous other military hardware including T-72 tanks were donated to the armed forces of the Ministry of Internal Affairs but these were also decommissioned in 2004 due to its reorganization process. Since 2001 Georgia started aspiring NATO membership and enhancing its military capabilities in cooperation with numerous post-Soviet suppliers such as the Czech Republic and Ukraine. In 2003 the Georgian government undertook efforts in acquiring modern hardware which included a delivery package from Israel over a classified number air defense systems and small arms. Expansions of the agreement that included a long term supply of Merkava III-IV tanks were repeatedly rejected from Israeli side. Thus Georgia began buying large amounts of T-72 tanks which led to a scandal involving the delivery of dozens of broken T-72 from Ukraine. Even though the new plan got revoked a large armoured fleet was established within a few years and in 2005 the Georgian army was able to field over 170 tanks during exercises. With help of Israel and Poland a large portion of T-72 tanks got upgraded with modern electronics. In 2007 Georgia began acquiring more modern hardware from Turkey and other NATO members. During the 2008 South Ossetia War, the Georgian military suffered numerous material losses including newly updated tanks and infantry fighting vehicles that got left behind. After the war, Georgia started filling these gaps with renewed agreements and increased its efforts to enhance the country's defence capabilities. Due to lack of support from its allies and Russian imposed weapons delivery blockades Georgia found itself in need of finding alternatives. Until 2009 Georgia was only able to produce uniforms and body armor, helmets which was so limited in amount that it never met the numerical requirements thus making Georgia still dependent from foreign suppliers.Georgia uses a series of domestically produced equipment which have been in mass production since 2009. These include up to seven land based vehicles, diverse weapons and areal vehicles for reconnaissance. After two years of development the country unveiled its first locally produced armoured personnel carrier, the Didgori. In 2012 the second domestically developed combat vehicle, called the Lazika Infantry Fighting Vehicle was unveiled. The development of the two new vehicles and artillery systems such as the ZCRS-122 have started the Georgian arms industry and reduces dependency on foreign suppliers. ↑ საქართველოს თავდაცვის სამინისტრო. Mod.gov.ge. Retrieved on November 5, 2013. 1 2 საქართველოს თავდაცვის სამინისტრო. Mod.gov.ge. Retrieved on November 5, 2013. ↑ Richard Woff, 'The Armed Forces of Georgia: An Update,' Jane's Intelligence Review, February 1996, 69-70. ↑ "Helping Georgia?". Institute for the Study of Conflict, Ideology and Policy. Boston University. March–April 2002. Retrieved February 14, 2007. ↑ “Batumi-Based Military Unit Mutinies,” Civil Georgia, 20 April 2004. ↑ "List of Killed and Missing Military Servicemen during the Georgian-Russian WAR". Georgia Ministry of Defense. June 8, 2012. Retrieved June 8, 2012. ↑ Shinwari, Sadaf (November 28, 2012) Georgia doubles number of troops in Afghanistan. Khaama Press (KP), Afghan Online Newspaper. ↑ Robson, Seth (March 7, 2011). "U.S. training a dual mission for Georgians". Stripes.com. Retrieved June 13, 2011. ↑ Structure of Land Forces. Mod.gov.ge. Retrieved on November 5, 2013. ↑ Вооружённые силы Грузии. milkavkaz.net (October 13, 2009). Retrieved on November 5, 2013. 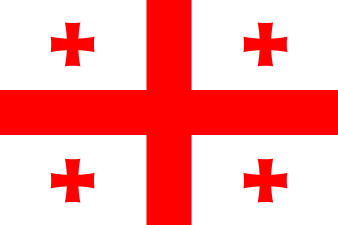 ↑ Georgia Army. Globalsecurity.org (September 30, 2012). Retrieved on November 5, 2013. ↑ Armament of the Georgian Army. Geo-army.ge. Retrieved on November 5, 2013. ↑ "Didgori Armoured Personnel Carrier, Georgia". army-technology.com. Retrieved June 1, 2013. ↑ "Lazika Infantry Fighting Vehicle, Georgia". army-technology.com. Retrieved June 1, 2013.